Skin care regimen won’t be complete without the eye creams. Eye creams are as important as your moisturizers since under eye area lacks glands that can lubricate the area. 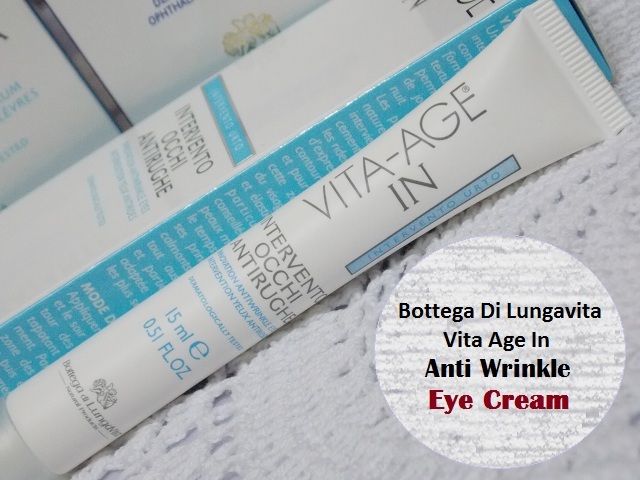 I will review Bottega Di Lungavita Vita Age In Anti wrinkle eye cream. This was being sent to me around a month ago and since then I have been using it. It actually came at the right time as I was about to buy a new under eye cream. 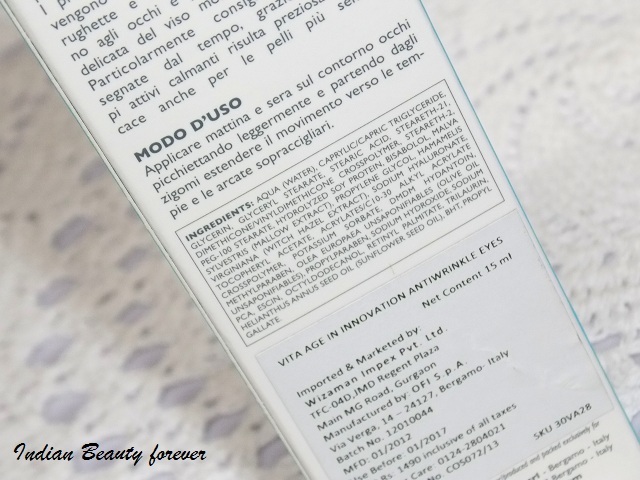 Price: This eye cream is priced at 1490 Rupees. 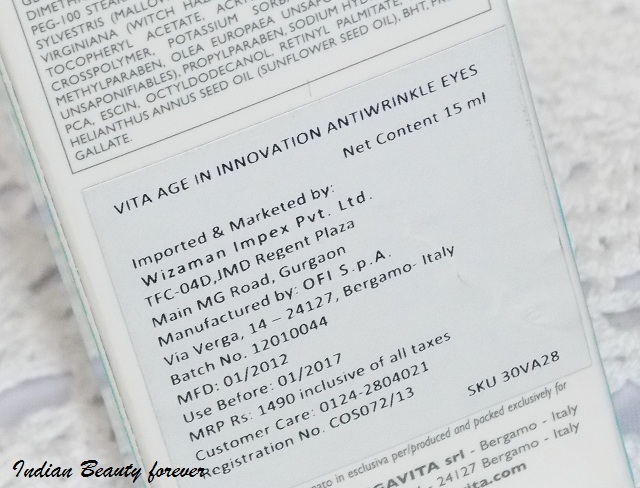 Bottega di Lungavita, is an Italian skin care brand that has been recently launched in India. Ingredients: Vegetable Ceramides, Hamamelis Extract, White Grape extract, Hyalauronic acid, Escin, Mallow Extract, Vitamin A & E, Olive Oil, ά-bisabolol. Method of Use: Dab on gently every morning and evening to the area around the eyes. Starting from the cheek-bones, spread the cream towards the temples and the arches of the eyebrows. Since it is non-greasy, make-up can be applied immediately afterwards. 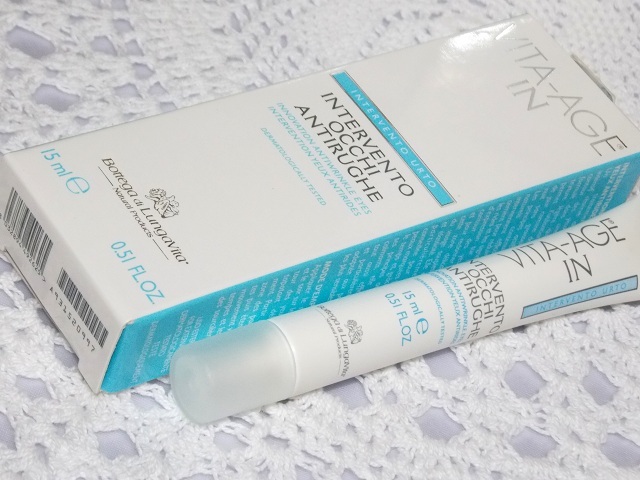 Thoughts: Vita Age eye cream comes in a very long and slim tube with a pointed tip. Very user friendly and easy to carry! The cream looks opaque white and decently greasy though doesn’t feel heavy on the eyes. It bears a mild chemical like fragrance and takes some time to get fully absorbed into the delicate skin under the eyes. As soon as this cream is applied, the under eye area feels hydrated. Make sure that you gently pat the area with your ring finger exerting gentle pressure. I have been using it twice a day and so far, I have noticed that the under eye bags have been reduced. There is slight improvement in the fine lines though not much, may be it needs more time. But as a daily under eye cream to hydrate the area is good. I find it light and non greasy which is why even if the formula is creamy it is fine for me to use that during the day without looking greasy or heavy else I go for eye serums and gel mostly! This 15 ml tube will last for more than 3 months since a little bit of this is sufficient.